Lewis Hamilton wasn’t able to celebrate his driver championship on the podium in Mexico, but in Brazil the stars aligned to ensure the Briton could lead his Mercedes team to a fifth constructors title with an unlikely victory in Sao Paulo. The newly minted world champion had qualified on pole, but he wasn’t favourite to win the race after the team’s uncompetitive previous two races. Making matters worse was that Ferrari’s Sebastian Vettel was starting alongside him on the grid with a more favourable set of tyres that would give him a strategic advantage — and the Scuderia had a shot at taking the constructors title battle down to the wire if it could outscore the Silver Arrows by 13 points. In no-one’s model of the race was Red Bull Racing’s Max Verstappen a victory threat, yet when Vettel got off the line slowly and struggled with his tyres, the Dutchman marked himself out as a wet blanket for Mercedes’s victory celebrations, scything from fifth to second in just 10 laps to pressure Hamilton for the lead. Red Bull Racing used its car’s superior tyre wear to run a substantially longer first stint than Hamilton was capable of to give Verstappen a faster set of tyres for the second half of the race. It worked a treat, and within five laps of his first pit stop he swept past Hamilton and into the lead at the first turn. The race was his — or it should have been, had it not been for an unusual crash with Force India’s Esteban Ocon, who was aggressively attempting to unlap himself, that sent him spinning off the track. Hamilton sprinted back into the lead with a five-second buffer, and Verstappen was unable to close. The Dutchman was furious, and though Ocon was handed a penalty in the race, Verstappen was reprimanded by the FIA for shoving the Frenchman three times in the garage at the end of the grand prix, requiring him to conduct two days of community service as penance. But Verstappen and Ocon’s scuffle was a sideshow to Mercedes’s historic fifth consecutive world championship. 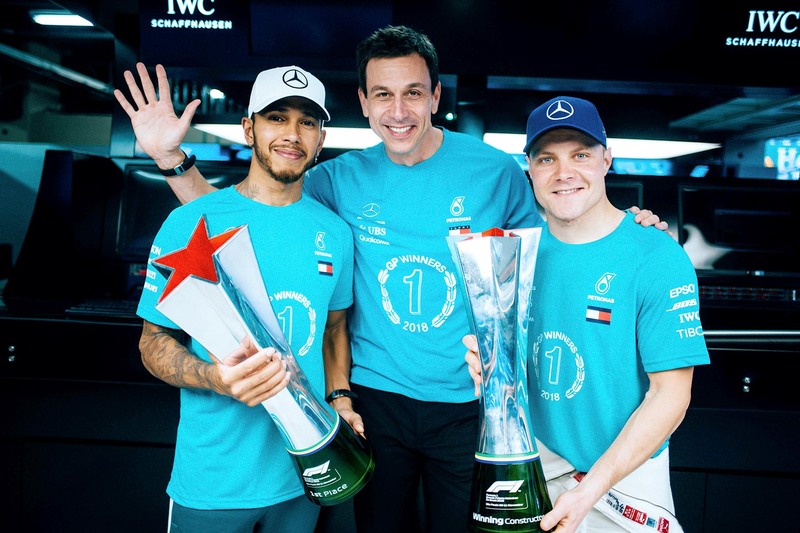 The feat puts the Silver Arrows outright second in the record books behind Ferrari’s six straight titles between 1999 and 2004 and equals the Scuderia’s benchmark for five straight driver-constructor title doubles won with Michael Schumacher in 2000–04. Remarkable also was that Hamilton’s win was his 10th of the season and his 50th of the 99 races run in the turbo-hybrid era beginning in 2014, underlining the Briton’s crushing form at the height of his career. “We’ve still remained fierce and competitive and I think our relationship is better than it’s ever been,” Hamilton said of his team. “Winning the [drivers] world championship, I didn’t really feel the celebration there because I knew that we still had another championship to win. “I really needed to remain focused for the team and I really came here just really focused on making sure that I could deliver for them. The 2018 Formula One season ends with the Abu Dhabi Grand Prix on 25 November.